As an old friend, I owe you my explanation as to why Alan and I felt it better to keep you and Can's analysis of the old Rossi demos here. In addition to what Alan said, I ask you to take a look at all the various threads. Notice how many? LF is very active now, and adding another thread, especially a Rossi thread, would add to the clutter and probably get lost down the page in a few days anyways. Allow me to take the opportunity to better expose the reasons why I strongly suggest to move the discussion started with the *can* analysis into a dedicated thread. I just gave a look to the threads included in the "Rossi & Industrial Heat" section. Yes, there are many, but none of them is dedicated to the January 2011 demo and to the other Ecat tests carried out in 2011. This is a big gap, because many the L-F members (including you) have declared to follow this forum since the beginning of 2011, due to that first Bologna demo and its echo in the world. Most of them are now aware that it was a farce, but if the calorimetric results reported in the Levi's report were real, there is no doubt that the date of January 14, 2011, would have been chosen by the UN to celebrate the World Day of the New Fire. So, I really don't understand why it was decided to deny the L-F members a thread were they could follow the discussion on the details of the January 2011 demo, as they can do for the Lugano report. I still think that the nice graphs posted by *can* would have been a good opportunity to fill this gap. And, no, I really don't see how a continuous switching between so different topics in this only thread dedicated to the current posts on JoNP helps to reduce the clutter. In any case, the final decision is up to you. I will conform. But my question was about why they chose the testing conditions so that the pump worked well outside its nominal range. Isn't it strange? It has been said many times that the Ecat could have ran out of control, and explode. To cool such a dangerous device by using a dosimetric pump whose nominal max. capacity was 12 kg/h, they should have chosen to operate the pump at an intermediate flow rate, let's say 6-8 kg/h, in order to have a margin to increase the cooling flow rate in case of necessity. Why would they have chosen to operate the pump at almost 50% more than its capacity? Levi's looks like a quick informal report, not really a proper paper. 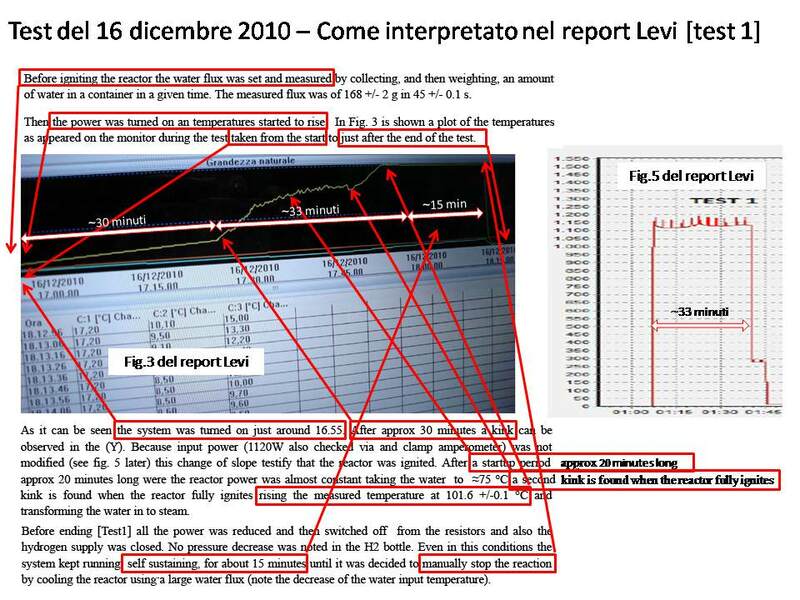 Levi's report was not an informal document. It features the UniBo logo on the cover, and was published as "Official report" (1). He's also the only author listed. Levi is the only author listed, because he was the designated responsible of the calorimetric assessment. But many people helped to gather information, and review the calculations presented in his report. The first was JR. The day after the demo, he wrote on Vortex (2): "Okay, I spoke with one of the people in the project about the calorimetry. Then I typed up the notes from our conversation as a brief report (400 words). I e-mailed the report to the researchers so they can confirm I got the numbers and other details correct, and also add the name and model numbers of some of the instruments." So, he could be considered the author of the first draft of the calorimetric report. He also asked the researchers to add the name and model number of some instruments. After a couple of day, JR also published the "Brief Description of the Calorimetry in the Rossi Experiment at U. Bologna, January 14, 2011" (3), where he wrote: "The experiment has been underway at U. Bologna since mid-December 2010. It has been done several times. Several professors with expertise in related subjects such as calorimetry are involved." But he didn't mention any name and model number of the instrumentation, apart the "HD37AB1347 IAQ Monitor (Delta Ohm)", which turned out to be a fake instrument. The last version of preliminary calorimetric report drafted in US is the "Brief Technical Description" (4), in which two more "prominent physical chemists" were mentioned as reviewers. So, many ghost authors contributed to this calorimetric report. I recall he initially planned to do a more complete and proper job later on with his colleagues as part of the UniBo research program that was supposed to be paid by EFA/Rossi and eventually never happened. Yes, I know, but this future intention does not justify the issuing of a sloppy and erroneous calorimetric report on the test carried out on January 2011. On the contrary, that possibility should have been a good reason to be as careful as possible in evaluating the actual performances of the Ecat. No, it can't be. In the Levi's report you find experimental data expressed in a very precise way such as "12686 +/- 211 W" or "146.4g +/- 0.1 per 30 +/- 0.5 s". This hardly shows any intention to "roughly assessing the order of magnitude" of the experimental data. On the contrary, those numbers are clearly aimed at giving the impression of a very precise and accurate work. he certainly didn't expect the Spanish Inquisition to pick apart every single detail yet. Apart the Spanish Inquisition (not a proper allusion), do you really think that they didn't expect that a document reporting those exceptional results under the logo of the oldest university of the Western world would have been scrutinized in every single detail? I don't think they were particularly concerned with knowing the precise value in l/h and they probably were already aware it could deliver more than rated. During "Test 1" earlier in December 16th they measured 164g in 45 seconds, that's 3.64 g/s or about 13.1 l/h. Beware! In the "Test 1" there was no pump! … and probably much less flow. Without too much thought and perhaps some haste in having to give a quick answer, 4.87 g/s can easily become "4 something" which multiplied by "roughly 3 and a half" becomes "maybe about 12 l/h" which is also incidentally the manufacturer's rated flow. Are you serious? Please, don't forget that we are talking about several professors of a prestigious University involved in an activity presented to the public as the most important invention in the human history. Yes, exactly. Thanks so much. The two new curves are very interesting. They help us to evaluate which one of the corresponding hypotheses on the status of the outflow is more realistic. In fact, these curves represent the sum of 2 components: the current heat stored in the Ecat (metal + water) plus the cumulative heat lost through its outer walls. This second component always increases over time. The first component is roughly proportional to the increase of the device temperature (which could be represented in first approximation by the outlet temperature) with respect to the ambient temperature. Therefore, the expected trend should rise up to t=50 min, when the outlet temperature starts to decrease. The expected trend is not followed at all by the violet curve, representing the in-out difference (with vaporization), and the possible reason is that the red curve overestimates the escaping energy because it includes some heat of vaporization. On the contrary, the brown curve, which does not consider the vaporization, is much closer to the expected trend. Its maximum is in a plateau around t=50 minutes, then it begins to decrease when the electric power is completely switched off. So we have a quite good indication that the fluid at the outlet was just liquid water at the boiling point, with a negligible steam content. An additional request for you. If you have the ability to capture data from a graph in an image, it might be interesting to complete the cooling phase of the temperature transient using the graph which appears in the upper right corner of last frame of the third video. It has been said many times that the Ecat could have ran out of control, and explode. Besides, if it's just an ordinary water heater like you think it is, they could have simply unplugged it from the wall. It's clearly not a research paper that one would be publishing on a peer-reviewed journal. Even Levi was aware of this, as I quoted earlier. And it's been presented as a "preliminary document". [...] So, [Jed Rothwell] could be considered the author of the first draft of the calorimetric report. He also asked the researchers to add the name and model number of some instruments. You're blowing things out of proportion. [Levi] [...] Then I have had the occasion to see the actual reactor or E-Cat first on December 15. 14 or 15. [Levi] Yeah, ok. 2010. And I was really amazed but it's always… you know: if you have to measure a few watts you can make some mistakes, but when you have kilowatts it would be very very difficult to make a mistake. We are at this phase, we are really interested on orders of magnitude, not making a real "precision", precise measurement. [04:07] [Levi] So, when you know that you are putting in about 1 and you are getting out about 10 or more, you already know that the system is working. [video cuts] I was quite sure on what we were putting in, because we have done a global measurement of energy, I mean electrical power that was going in the experiment, and then making a measurement of calorimetric energy produced. It's clear that the plan was doing much more complete and better instrumented measurements later on that would survive more intense scrutiny. He did say that he would have given more precise numbers later on after checking them out. You're again blowing things out of proportion. This is the old "Lugano revisited" thread, now renamed so as to accommodate *ALL* of Rossi's earlier demos. Ascoli/Can's related posts from the Rossi discussion have been moved here at authors request. May I ask, what was it in your opinion? Do you also believe that they were getting 10 or more kW, by putting in 1 kW? Thanks. Its accuracy is more than sufficient to distinguish an electric heater from a nuclear reactor. Now, if you like, you can extend the blue, the orange and the brown curves (those w/o the vaporization) of your previous graph, getting a quite complete and realistic picture - from the point of view of physics - of what happened in Bologna on January 14, 2011. Shane, I appreciate your generous and friendly effort to remove our posts on the Bologna demo from the "Rossi blog" thread, however that's not the solution I had in mind. The "2011 tests" and the "Lugano test" deal with two different devices, the LT Ecat and the HotCat, which use completely different tricks ... ehm ... physical principles. I realize that this solution is the best I can get, and I thank you, but I feel to apologize with the people who were quietly discussing about the HotCat technical arguments for the troubles of having their comments interspersed by others on different topics. It was a joint decision so we thank you. I know it is not exactly as you wanted, but it is a workable compromise. While you are correct in saying Lugano was the HT (HotCat), UOB the LT (LowTemp Ecat), and different "tricks" were used, the fuel was the same in all. Rossi patented his Energy Catalyzer (Ecat) fuel, not the reactor housing. So all demo's, and Lugano share something in common. I think Para/LDM/THH will easily be able to continue on with their discussion of Lugano, alongside you and Can discussing UOB. Who knows, by combining all together like this, something constructive may come of it. as I said, Rossi's now abandoned EO patent was for his Energy Catalyzer (Ecat), which is the fuel. In his approved USPTO "Fluid Heater" patent...which was not for LENR BTW, he describes his Ecat (fuel) in a wafer form, with layers. In one embodiment, the wafer had a heating wire sandwiched between layers. In the depiction, it shows what looks like a *solid* wafer. As if it was compressed. Yet, I have never read of a wafer actually being used in any of his demos? It is always loose granular metals in no particular order. At Lugano, they supposedly watched as Rossi scooped some of the spent fuel out, handing it over to them for analysis. You do not scoop a solid wafer. Now, with his QX/SK it sounds as if he has incorporated his fuel mixture, whatever it is, into the electrodes to produce plasma? Yes, The Lugano questions are complex and separate from all the others: it would make more sense to have an "All non-Lugano earlier tests" thread. Still, I'm not convinced the earlier tests are worth many more words, they have been thrashed out, and the "tricks" are understood by all except the likes of Adrian, who has not paid much attention to this history. From the graphs it's apparent that variations other than from joule heating were also contributing to the temperature changes observed, so what can be said is that it wasn't operating as a simple joule heater. Whether these variations were from other heat sources or undocumented changes in the experimental parameters, that cannot be concluded from the data and information presented in the report. Therefore you can't say that the picture you're painting is more realistic. There's ample to pick apart in that report without resorting to conjecture. For example, there almost seems to be a disconnect between what the photos show for Test 1 and what is being described in the text. I'm not sure of what is going on exactly. Wafer-like devices held together with clamps could be spotted in old videos, like for example this one at 6:06, 8:13. The 3D animation shown in that segment for some (coincidental?) reason also shows a 'wafer' core. Yes, The Lugano questions are complex and separate from all the others: it would make more sense to have an "All non-Lugano earlier tests" thread. Yes, it would have been much better to have had a separate thread called "Ecat – January 14 demo and other 2011 tests", but it would not have been a good showcase for LENR. Btw, sorry for the intrusion. In 2011, almost a dozen tests were carried out on different versions of the LT Ecat. Most of them would worth a deep analysis, and many words. But, as you said, most of the "tricks" are by now well known. Anyway, at this point, the most important aspect is not the technical one, also cited in the present title of this thread. Many agree that the January 2011 demo has been a farce, a comedy played in front of the world audience. Hard to believe that there was only one actor on the stage. Recognizing the whole cast, could be very helpfull in solving many other Ecat issues, including the remaining techncal questions on Lugano's and other HotCat tests. From the graphs it's apparent that variations other than from joule heating were also contributing to the temperature changes observed, so what can be said is that it wasn't operating as a simple joule heater. Are you talking about the "change in the water heating rate" you pointed out yesterday (1)? It is not necessary to suppose any source of energy in addition to electric heaters to explain this behavior. You only need to consider the actual configuration of the device and the position of the probe for the output temperature. Here you have a schematic of the Ecat. My note: this schematic corresponds to the small version of the LT Ecat, which was used since the test on March 29, 2011, when Essen and Kullander were also present. Anyway, the layout is similar to the larger version used in previous tests. You can see that the two electrical heaters – 1 internal + 4 external in the January version – are positioned on the horizontal arm of the Ecat, while the T2 probe was inserted in the vertical arm. Therefore you should consider the delays due to the thermal inertia and transport. It is natural that the heating rate increases with time. It is more than plausible that within 8 minutes from power on, the temperature of the metal closer to the resistors was well above the water boiling point, so as to induce the liquid to boil locally, which in turn enhanced the heat transport by convection. Opening, or closing, a valve connected to a bottle has nothing to do with the temperature trend. It was a choreography. We can be quite sure that there was no hydrogen in that bottle, it wouldn't have been safe with so many people around. Whether these variations were from other heat sources or undocumented changes in the experimental parameters, that cannot be concluded from the data and information presented in the report. Once you realize that the coolant flow was no more than 7.2 kg/s (i.e. 40% of the value written in the report), you need no other heat sources beyond the electric power to explain the temperature trend. Furthermore, the actual coolant flow could have been much less than 7.2 kg/h. Maybe, it was diminished after the output temperature dropped for a while below the boiling point. Therefore you can't say that the picture you're painting is more realistic. This is my opinion, of course. Do you think the picture in your first energy graph (2) is more realistic? What you should mainly consider and what was published in early 2011, is that the external band heater can only heat the cooling water, which makes no sense whatsoever unless Rossi is spoofing the results. Good point! The private test carried out on December 16, 2010, and labeled as "Test 1" in the calorimetric report issued after the January 14, 2011 public demo, has been ignored by almost everyone, but it is one of the most interesting. If you like challenges, this test is for sure one of the best to understand. Let me give you some hints. Also in the description of this test there is something that does not convince at all. The greatest perplexity concerns the interpretation that is attributed to the first "kink" of the yellow curve (the curve which represents the temperature inside the Ecat). This "kink" appears 30 minutes after the first time in the diagram and according to Levi it would mark the reactor's ignition. But this interpretation is in conflict with the remaining timing provided in the report itself. In fact it is reported that the reactor remains in "self-sustaining" for about 15 minutes before it was "manually stopped". Nevertheless, figure 5 shows that the maximum power lasted for about 33 minutes. Transferring these 2 periods on figure 3, it is possible to locate the switching of the electric resistances just before the said "kink". Therefore, this first "kink" does not indicate at all the ignition of the reactor, but merely the power on of the heaters. This last would have occurred at ca. 17:20 and not at 16:55, if this is what it was meant by the words "the system was turned on". The seeming linear increase of the internal temperature, which starts from the left edge of the photo (it should be noted that the left side of the photo has been cut away), depends on an error in the use of the data record system. It is deductible that after having recorded the first set of values at its switching on, this record system no longer recorded any further value until the sampling step was set at an interval of 10 seconds (as deduced from the values listed in the first column visible in the photo). This new setup only took place when the temperature had already started to rise, shortly after the heaters were switched on. As a consequence, in the absence of any intermediate value, the program that drawn the curves has pulled straight lines going from the first lonely starting point up to the instant in which the regular periodic acquisition of temperature data has begun. But, it seems that this slow and regular temperature increase has been interpreted in the Levi report as the effect of the heaters, and consequently the successive sudden slope change (the second kink) following the setting of the correct acquisition frequency has been presented as evidence of the reactor ignition. The above picture also points out the possible cause of the seeming "self sustaining" operation: the flow of the coolant was stopped for about 20 minutes! It happened when the temperature was reaching an asymptotic value of 80 °C. Evidently, this was the equilibrium temperature with a flow rate of 13,1 kg/h and an input power of ca. 1120 W. As the flow was stopped the temperature started to rise again. A while after the outlet temperature reached the boiling value, the electric power was switched off, simulating in this way the onset of the self-sustained mode. Finally, as soon as the water temperature began to decrease below the boiling point, the water tap was fully opened to cool the device as quickly as possible. - at 18:12 the water tap was suddenly opened and the coolant circuit was flooded. Btw. Your last graph is really very nice. My best compliments. Could you please modify it on the basis of the above new timing, and then draw the new energy graph? One more challenge for you. If you are able to accurately grab also the inlet temperature (the light-blue curve) you will get a confirmation about the interruption of the cooling flow. The two models used in the Ecat tests carried on until June 2011 featured also an internal cartridge resistor (see ICCF21 Thread ). But this is not the point. Nor Rossi is. It was clear since the beginning that he was not a scientist, but only a PR man. Did you ever believe him? Again, Rossi didn't perform any steam measurement, he only reported the results of measurements made by others: authoritative academicians, researchers, physicists, long time experts in CF/LENR, and so on. As for the slide from ICCF-16, I already mentioned it many times in the past. But you forgot to remind that another author of that same presentation is a physicists and long time expert in CF/LENR, who, according to his wife and to Krivit, has been the main promoter of Rossi, since the beginning of his involvement in the field, and a strong supporter of the Ecat well beyond the 2011 tests. Does the graph below make sense to you? Apart the cumulative energy out. It should remain below the cumulative energy in. But you can easily fix it by delaying the beginning of the flooding in order to be much closer to the sharp drop of the outlet temperature. The curves of the inlet water and ambient temperature also make sense. But I would suggest you to add also the stepwise trends that appear on the photo. That photo is taken from a PC screen, so you see that the curves are made by horizontal straight lines due to resolution of the screen. In this way you get less realistic trends, but closer to the available information. Could you also share the file with the data? I have to point out that inlet water temperature, measured close to the device, starts decreasing roughly one minute earlier. Also would a 100 g/s be reasonable as a large water flux given that in the same testing environment during the February 18-hour test a rate of almost 1000 g/s was reported? On a related note, I've just checked that the faucet in the bathroom on the first floor of my house can, at this time of the day, comfortably fill a 2-liter water bottle in 10 seconds. I will post the digitized and interpolated data after this will have been clarified. The post was edited 1 time, last by can: It was a 2-liter bottle. ( Jul 5th 2018 ). To go out on a limb a bit, it is entirely feasible that during the October 2011 demo the hot water was pumped out of one "steam" pipe from the container into a condenser, out to the reservoir, through the reservoir communication pipe to the other reservoir, and was drawn from the second reservoir into the other condenser, and from there back into the container via the other "steam" pipe. That explains how the water can move uphill into the reservoir from the condenser, which would otherwise be 3/4 full of water (matching the water level in the reservoir), or would require a pump from the condenser to the reservoir, which was not there.